Discovering the right product is a vital part of a product development process. To do that effectively best product teams use a Product Discovery process. This process foresees you having a discovery backlog with a list of ideas, concepts, and hypothesis in need of validation. But how to get ideas in the first place? And how to decide what ideas are worth putting into a discovery backlog? They really are. There are many more ideas than resources to validate and realize them. Customers and users: there is no substitute for talking directly to your customers and users. The most valuable product ideas come from this. Looking into data: learn how your customers use your product. Listening to feedback: custom support data, social media, reviews. Competitors: but be careful here - blind copying leads nowhere. UX and Product: those two vital roles are usually the closest to the understanding of customer and user needs. Sales and Executives: almost no way to not listen to them. Very often they have some valuable feedback being in a constant contact with customers. Technology: these guys know what is possible. And what are possible changes quite often. Whatever filter you would choose to use make sure it is simple. At this stage of the discovery process, you don't need scientific precision or hard evidence. At this stage, you want to quickly separate potentially good ideas from the bad or unrealistic ones. Potentially is a key word here. Until you do a research (and even after) your concepts would stay potential. That would continue to be the case until you release your ideas to the real world and see how they work. So don't waste your time figuring out sophisticated filters. Everyone in your company should know what filter you use. There should be a complete transparency on how to submit a new idea and how this idea will get evaluated (filtered). Being transparent about your filtering process would encourage people to submit more ideas and will help you keep good relations with people. It's a good practice to have an owner of a product discovery backlog. Otherwise, if anybody is allowed to drop ideas there it quickly becomes an unmanageable trash bin. An owner of a discovery backlog will receive ideas from various sources, quickly evaluate them and either put them into a discovery backlog or bounce them back. Does the idea solve a real user problem or contributes to a better solution of an existing problem? Does the idea support the product strategy? What objectives or KPIs could be affected by that idea and how significantly? This simple filter gives you a sense of value the idea could produce. Value for your customers and users but also value for your company. And then, of course, the usual question of feasibility. 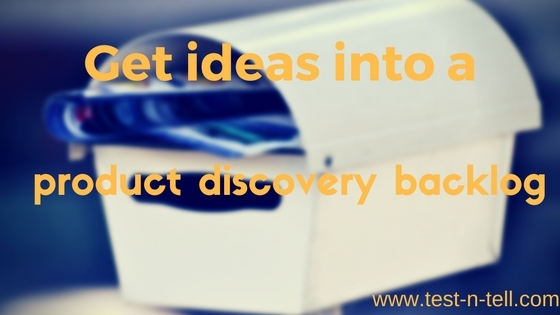 If the idea passes the filter, put it into the discovery backlog. To successfully start a Product Discovery process creates a space for ideas and encourage an entire company to submit product ideas. Run ideas past the simple filter and if pass put ideas into the discovery backlog. This backlog should support the order, be transparent and have an owner. Having a discovery backlog is a major step on a road to product customers will love.